Overlooking a river among green hills, Limoges has long been synonymous with the finest porcelain, while its tradition of enamelware goes back even further. Many sights and attractions are centered around this proud history. Those industries brought immense wealth to the town, which reflects in many of the town's impressive medieval buildings built of local rose-tinted granite. The air of prosperity and style with good shops and restaurants, plenty to do and always more to discover. Opening hours: Most shops are open from Monday to Saturday at 9:30 AM - 12:00 PM 2:00 PM - 7:30 PM. Food stores open earlier in the morning and some (especially pâtisseries) open on Sunday mornings. Most supermarkets open from Monday to Saturday at 8:30 AM - 7:30 PM, and have late closing on certain days. Most museums and sights keep similar hours, but are closed one day a week, usually on Monday or Tuesday. Banks open either from Monday to Friday or from Tuesday to Saturday at 9:00 AM - 12:00 PM and 2:00 PM - 5:00 PM. For anyone interested in porcelain, Limoges is the place to go – with shops and museums devoted to the subject. But Limoges cannot be reduced to this part of its history and also offers many surprises such as the palace looking 1920's railway station and the La Règle subterranean tunnels. Around the city is the Limousin, an unspoiled, rustic region of woods, green meadows and rough pasture, simple cottages, flocks of sheep and beefy Limousin cattle. The Adrien Dubouché National Museum was started from an impressive private collection with over 12,000 ceramics in all forms including the finest Limoges porcelain. 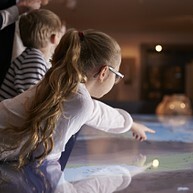 For an additional fee, visitors can get the most out of the museum through an audio guide in French or English. Two separate medieval quarters at the center of this spread-out city are: La Cité, around the Gothic cathedral, and the Château (or Motte) quarter with its charming streets and lanes around the former marketplace. 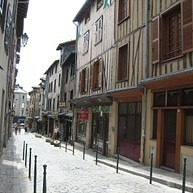 The Butcher's street in the heart of the Motte quarter is worth a detour. The domed Gare des Bénédictins, the city's train station with its 60 meter tall clock tower is surely one of the world’s most beautiful train stations and surprisingly Limoges' top sight. 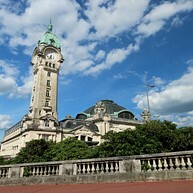 You don't need to be embarking on a train, but this is a must-see in Limoges. 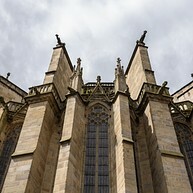 The Cathedral – a Gothic masterpiece surrounded by gardens, episcopal buildings and picturesque lanes of half-timbered houses is at the center of La Cité, the old town of Limoges. Guided tours of the Cathedral are available if you want to learn about its history. 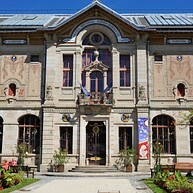 The Limoges Fine Arts Museum (Musée de l’Evêché), which is located in the former Bishops’ Palace, contains a huge collection of Limoges enamel from the 12th century to these days. The museum was founded in 1912 but reconstructed between 2006 and 2010 to turn into the modern and intriguing building today. Surrounded by a beautiful castle, this great zoo is located in the nature. You can walk around, interact with animals, have a picnic at one of the wooden tables. Most of the animals are not caged and benefited from a pleasant environment, where you can also feed the goats. Just outside the Cathedral, Jardin botanique de Limoges is a very pleasant place to take some fresh air in a very green environment. The garden is separated in several areas that we entice you to discover. You can find international plants and water flowers here. 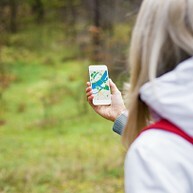 Terra Aventura is an adventure based on the Geocaching game where boxes are hidden and the nature and must be found through GPS by the players. In Terra Aventura, players have to solve several clues to obtain the GPS code of the hidden boxes. A great adventure is waiting for you. This museum is an organizationally classic yet very moving experiment. It offers an in-depth look at France during WWII and the actions taken by the Resistance with useful audio guides. Being provocative and comprehensive, this museum will make you think and remember.